Older homes are charming and full of much more character than newer properties. In many cases, the materials can stand the test of time, but plumbing is a completely different ball game. We have put together our top plumbing service tips and the 10 things plumbing features to check before buying a home. Have a professional plumber take a look at the sewer line to the street. It’s important that a video camera is sent through the line to identify any potential problems. Tree roots, corrosions and clogs can all break down a pipe and cause the drain collapse, which would require immediate attention once the event occurred. Take a look at the age, water heaters should last at least 10 years. If the water heater is a lot older than that, then you may need to consider replacing it. Have a look at the environment the water heater is stored in – will it cause a problem if it ever happens to leaks? These are all important questions you need to make before making any big decisions. Check out the toilets for leaks at the base, as these kinds of leaks can lead to significant damage – sealing a leak will only make the problem worse in the long run! If you’re worried the toilet may have a leak, you can expect to see a rocking toilet, discolouration at base of warping. Ensure you flush each toilet to make sure there are no clogs. 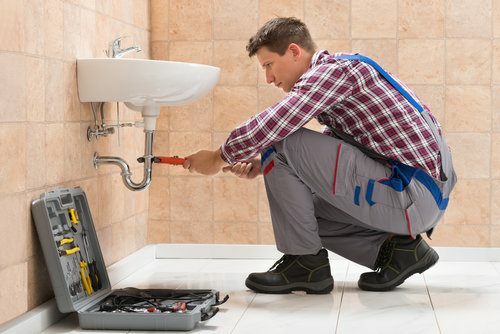 Pay a professional plumber to thoroughly check the water supply pipes. They will be able to find out the age of the pipes and whether or not they have been previously replaced, the material of the pipes and whether they’re safe to be replaced if needed. When you’re viewing the property and you spot water lines, be sure to try and check them out. Water lines usually occur under the sink or in the basement ceiling. You’ll be able to spot water lines by finding water discolouration or leaks. Even though drain lines generally don’t corrode, play it safe and ask a plumber to look down the drain. They will be able to spot any trouble and advise you on how best to deal with it. Turn on the taps to check for any rust. If the home you’re looking around has been empty for a while, it’s normal for a bit of rust to drain out, but if the house was previously owned then chances are the rust in the water could be corrosion. In order to test the water pressure, turn on all faucets at once. To get high enough pressure, you’ll need 3/4″ pipes from water source to home, and at least 1/2” or more to faucets. If you have space below the home such as a basement, ensure you check the space for water damage, leaky pipes or inadequate repairs before signing over the contract. Although showers vary in pressure, make sure that when you turn the shower on there is a solid stream of water. If the shower is struggling to hit temperature or the water is running slow, it’s likely there is a water pressure issue in the house.